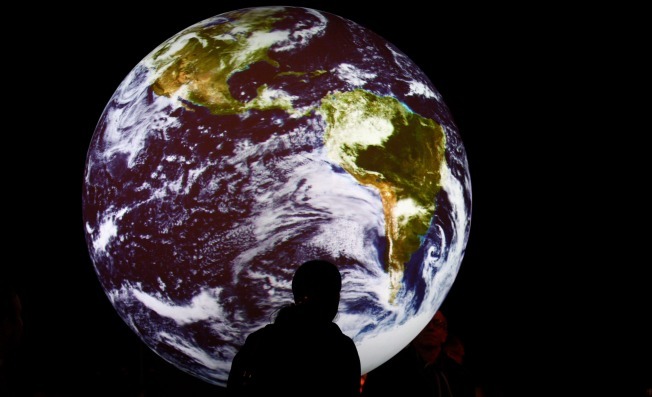 A man walks past an animated projection of the globe named 'Science on a sphere' inside the U.S. Center 09 at the Bella Center on Sunday in Copenhagen, Denmark. Politicians and environmentalists will meet for the United Nations Climate Change Conference 2009 which opens today and runs until December 18. COPENHAGEN — President Barack Obama’s decision to participate in the end — rather than beginning — of the international climate change conference here stems from some newfound hope that negotiators can reach a deal by the time the conference wraps up at the end of next week. But there’s a lot to do between now and then. As delegates from more than 190 countries arrive in the Danish capital, they’ll confront more than just a dizzying schedule of meetings, a sea of protesters and a bicycle-powered Christmas tree in City Hall Square. They’ll have to navigate Pacific Islanders who want protection from rising sea levels; Africans who want billions of dollars in aid to cope with severe droughts, freak storms and spreading tropical diseases; Chinese and Indian delegates who don’t want global-warming-prevention measures to slow their development; and leaders from the United States and the European Union who want to cut emissions without hurting already shaky economies back home. How will you know if they’re making progress? Here are five things to watch. 1. Can they cut it? The centerpiece of any deal will be the various countries’ agreement to cut greenhouse gas emissions. Developing countries argue that richer nations have created most of the global-warming pollution over the past century through their industrialization — and, therefore, they should be the ones that make the deepest reductions. But U.S. negotiators do not want to make drastic cuts unless emerging countries like China and India agree to their own robust reductions. So far, the European Union has vowed to slash emissions to 20 percent below 1990 levels — more if other nations agree to do the same. Japan has set a goal of a 25 percent reduction from 1990 levels, an almost 30 percent cut from 2005 levels. And last month, White House officials promised to cut greenhouse gases to 17 percent below 2005 levels by 2020. That amounts to a mere 3 percent or 4 percent cut below 1990 levels, according to experts, and it’s unclear whether that’s enough to satisfy China, India and other developing nations. A draft text of the pact circulated by Danish officials would have nations agreeing to cut emissions in half by 2050, but China and India say they oppose that target. “If the Denmark draft is any indication, then we are heading to a dead end,” Jairam Ramesh, India’s environmental minister, recently told reporters. Brazil, South Africa, India, China and Sudan plan to submit their own draft — one that rejects legally binding emissions cuts. And poorer countries have already agreed that they’ll walk out of the talks if developed nations try to impose their will on them. 2. Is there any money on the table? One of the most contentious issues at the summit will be figuring out climate financing — or how much rich nations will pay to help poorer countries develop new, clean technologies and deal with the devastating impact of climate change. Although they have contributed relatively little to global warming, poor countries in the Southern hemisphere are likely to feel the worst effects of climate change over the next few decades. Rural African farmers already face changing weather patterns that disrupt centuries of traditional farming methods. Small island nations are sinking under rising sea levels. And national security experts predict that a scarcity of water and other resources will exacerbate conflicts in already strapped regions. Now, they say, it’s time for the United States, Europe and other developed countries to pay up. The World Bank estimates developing countries will need $75 billion to $100 billion per year over the next 40 years to adapt to climate change. But that’s more than most rich nations are willing to pay. Developed countries are expected to propose jump-start financing closer to $10 billion per year through 2012. “I think it will be very difficult, if not impossible, to reach agreement on that exact long-term cost sharing,” Yvo de Boer, the top U.N. climate official, said last week. How the funds are distributed presents another difficult issue. The United States has proposed a new global fund that would operate under the World Bank. But poor nations and environmental activists have long been skeptical of the bank, which they say favors richer nations and focuses too much on the development of fossil-fuel industries. China, the world’s largest emitter of greenhouse gases, has long resisted adopting binding emissions limits. Its position has made reaching a deal extremely difficult because the United States is reluctant to act unless China takes some serious steps. But some progress was made last month when Chinese officials promised a “carbon intensity target” that would lower greenhouse gas intensity 40 percent to 45 percent per unit of gross economic output by 2020. Still, Western officials remain deeply skeptical of China’s ability to follow through on its promises. Although Chinese officials promised their targets would be binding, they would not be subject to verification by the world community. But China’s “word” isn’t enough for many developing nations, who want to put in place strict systems to measure, report and validate the Chinese emissions cuts. In the United States, manufacturing-state lawmakers also want to impose border taxes on Chinese imports if the country fails to take sufficient emissions reductions actions by a certain date — a proposal that sets the two countries on a collision course. China and other emerging economies have threatened to walk out of the talks if they are used to set up trade barriers. 4. What does Congress say? It’s a classic Catch-22: Without congressional action — or at least the promise that a Senate bill will come soon — foreign nations will be unwilling to make their own reductions. But unless international negotiators make movement toward a global agreement, U.S. lawmakers will resist making cuts at home, fearing that new regulations will drive manufacturing jobs to cheaper markets such as China and India. That interdependency means that everyone in the Danish capital will be keeping a close eye on the congressional reaction to the negotiations. And one thing is certain: They’ll be hearing the full range of outrage. The House has already passed a cap-and-trade bill, and Sens. John Kerry (D-Mass.) and Barbara Boxer (D-Calif.) will be in Copenhagen to assure the world that the Senate will follow suit soon. Democratic moderates released a letter last week saying they’ll support binding targets — as long as competitors like China and India also make commitments. But Sens. Jim Inhofe (R-Okla.) and John Barrasso (R-Wyo. ), longtime global-warming skeptics, are also traveling to Denmark — as a “climate truth squad” focused on informing the world that the U.S. Congress opposes the climate bill. The Obama administration announced late last week that the president will travel to Copenhagen at the conclusion of the talks rather than this week, as he had originally planned. But for Obama’s in-the-thick-of-things visit to have much of an effect, he will have to make a serious commitment to getting a climate bill passed and signed this spring. International climate experts say such a promise is the only way to give other nations the reassurance they need to make their own emissions cuts. “They’re looking for that assurance from the president himself that this is going to get done,” said Keya Chatterjee, climate program director for the World Wildlife Fund. That pledge is particularly important, says Chatterjee, because the world has been burned by Congress before. In 1997, lawmakers voted to reject any international deal adapting any climate treaty that exempted developing nations. It was a vote that effectively killed U.S. participation in the Kyoto climate treaty. At the same time, Obama must be careful not to overpromise. Administration officials know that a repeat of Kyoto would be a major defeat for the White House — and for efforts to slow global warming overall.